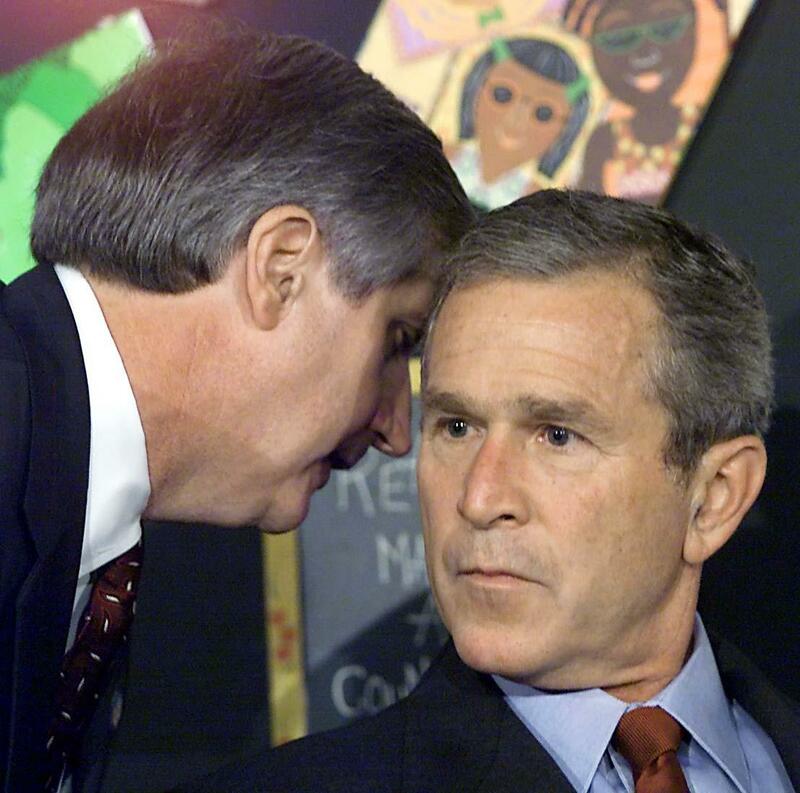 Why did President Bush react so calmly when told about the Sept. 11 terrorist attacks? I’m no fan of George W. Bush, but having worked for a member of Congress and other elected officials and having supported them at public events, I always thought it was a cheap shot to criticize Bush’s immediate response to the news of the Sept. 11 attacks. President George W. Bush, right, is interupted by Chief of Staff Andrew Card while reading to schoolchildren in Sarasota, Florida, on Sept. 11, 2001. Many people have seen the video of Bush as he received the news from his White House chief of staff, Andrew Card. The president was reading a book to schoolchildren in Florida, covered by a dozen news cameras. Card approached, whispered in his ear for a few seconds, and departed. Bush calmly continued chatting with the children, showing no sign that anything was amiss. Several minutes later, he excused himself and left. The first time that most Americans saw this video was in 2004, when Michael Moore included it in his film Fahrenheit 9/11. Many formed a quick judgment: You see, Bush is such an amateur, so indecisive, that he choked under pressure. He should have rushed to direct our defense against the terrorist attacks. But he’d rather read a book to some kids. This criticism is too lazy, too cute. To me and many other political aides, it seemed obvious what had really happened: Card had whispered a brief update, lacking details, and had not urged the president to cut his public appearance short. How much information could Card have given in those few seconds? Was that long enough to convey the full scale of the emerging picture? And what was the urgency in Card’s voice? I can tell you this: If you work for a public official and need him or her to immediately drop everything and come with you for an emergency briefing, no matter what the assembled media might report, then you would just tell the official that. You wouldn’t whisper a lengthy explanation in their ear in front of a dozen news cameras. It was absurd to think that Card urged the president to leave the event and that the president just ignored him. It seemed far more likely that the president was told: It’s bad, but we’re on top of it, and we’ll be ready to brief you in a few minutes, so sit tight. Bush would have concluded that his highly competent military and intelligence advisers were forming a game plan. Rather than make a sudden exit from a public event, one that would trigger unhelpful speculation about an emerging crisis, he wrapped the event up quickly but casually. I had a hard time saying that was unreasonable. There are plenty of legitimate criticisms of President Bush, as there are of President Obama and most other elected officials. But this one missed the mark. George W. Bush: Is George W. Bush more competent than Barack Obama? 9/11 (terrorist attack): What was flying like pre-2001?